I recently stumbled across another good looking natural skincare brand which I've quickly added to my ever growing shopping list. 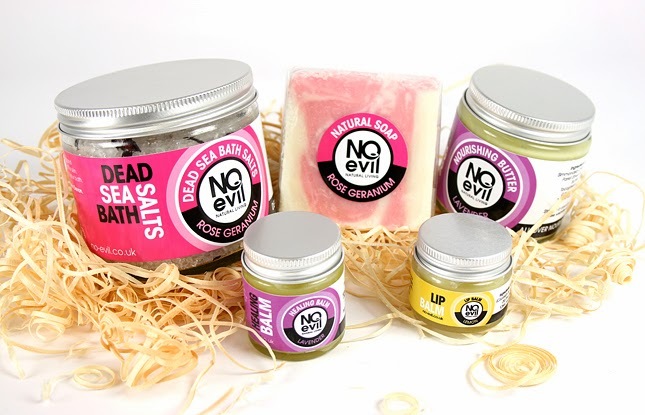 I reached out to No Evil's founder and creator Jayne, to seek permission to use some pictures and ended up doing an interview. So here you go folks, enjoy! Tell us a little bit about yourself and how did No Evil begin? I'm actually a former factual entertainment television producer who unwittingly trashed her career by having 3 children. It never occurred to me that there were very few women working in the television industry over the age of 35, then I had a baby & abruptly found out. So I've been a stay-at-home Mum for the past 8 years. About a year ago I had a light bulb moment when I got fed up with having dry hands all the time & always applying hand cream. Every Mum will know that when you have small children you seem to be forever washing your hands. And then it occurred to me : this isn't normal. Our ancestors didn't have dry hands all the time & although this was in part due to the fact they also didn't have soap & probably had to be extremely careful in regards to certain bacteria, I just thought that there had to be a better way. I was sat in the kitchen when I had this thought, so I reached for some olive oil to rub into my sore dry hands instead of the usual hand cream - olive oil is a far more effective & natural moisturiser than the horrible chemically-loaded but expensive hand cream I'd been using. Then I remembered that you could make soap with olive oil, so I investigated it further & thought I'd give natural soap making a try. One thing inevitably led to another & earlier this year after becoming so passionate about the skincare I was making for myself & finding it was far superior to anything chemically-enhanced, I decided I wanted to start selling my products. All my products have been assessed by a Chartered Chemist & registered with the EU in accordance to EU Law - a slightly daunting, lengthy process, but well worth it in the end. Were there any particular ingredients which you decided would have no place in your products. Yes, absolutely. When I started researching natural skincare, I discovered that although some products were mostly made from natural plant-based ingredients, many of them still contained artificial fragrances & preservatives. You see, in order to make 'creams', a manufacturer has to add water to their products. But if you add water, you introduce bacteria, which can make your product go rancid. So many manufacturers then have to add chemical preservatives, such as parabens. But I didn't want that. I wanted to create skincare that was 100% as close to nature as possible. Humans are a part of nature. We've evolved on this planet alongside plants & we share a special relationship. I then started to read a considerable amount about plant oils, especially how they affect & interact with our skins. And when I made my first moisturising butter I literally wanted to sing sand dance about it. The way the oils soaked into my skin & nourished it deep down, conditioning it & giving my skin such a velvety feel was just mind blowing. Seriously, I've searched for YEARS for decent face and body moisturisers and I have never been happy with what I've bought. Now I will never deviate away from my All Over Nourishing Butter - I don't want a chemical anywhere near mine or my family's skins ever again, they're just horrible. What was the first product you formulated? It was olive oil soap as mentioned above. From the first use I knew I'd never buy another chemically-manufactured soap again. It was so moisturising! It took me quite a few months to perfect the art of soap making though. It's a tricky skill to master & the essential oils behave differently in every batch. There lots of expensive mistakes along the way, but things are pretty slick these days. I'm proud of my soap bars - they smell gorgeous, produce a really fluffy lather, moisturise your skin & are so gentle & kind they can be used by anyone with sensitive skin conditions without aggravating their complaint. They're also made with nothing but Olive Oil, Coconut Oil, Responsibly Sourced Palm Oil and pure essential oils. Strangely enough, I don't find anything challenging, just exciting! I've got about 100 new products up my sleeve just waiting to burst out, but my business is very young at the moment, so I'll have to wait a while until I can start releasing new products regularly. One thing is for sure: my products contain NO EVIL whatsoever & never will. You don't have to use chemicals in order to make superior skincare products. In fact, skincare without the chemicals is far superior in every way - they don't cause cancer and they nourish your skin so completely, you use less of them. Take my lip balms, for example. I used to apply a well known petroleum jelly to my lips, literally 30 times a day. As the petroleum jelly wore off, I always had to reapply as my lips became so dry. But when you use my lip balm - which is made from shea butter, coconut oil, avocado oil and beeswax - one application is so moisturising you won't feel the need to reapply for hours and hours. Your lips are so conditioned and healed deep down, you won't want to keep sloshing it on every 5 minutes. What have been the highs and/or lows of establishing No Evil? Highs: just about everything, especially dealing with my amazing design team at Frankman Design in Torquay. Brilliant & humorous, they immediately 'got' the natural skincare concept & are so easy to do business with. Plus they're rather talented. Lows: As with most start-ups, I'm sure it's the money situation. I have ideas & plans which far exceed my budget, but I'll get there eventually - I'm determined like that. I think that when you have such a conviction to 'spreading the word' about natural skincare, nothing is insurmountable. What does the future hold for No Evil? I have no idea, I don't own a crystal ball. However, what I can tell you is that my aim is to make natural skincare a genuine mainstream alternative to the chemical rubbish that currently litters our shelves. As I see it, the problem at the moment is that most people buy their skincare from either a supermarket or a chemist & both these establishments stock nothing but nasty chemicals. The mainstream consumer doesn't have a genuine, convenient choice. It's only when a person develops a skin complaint that they begin to seek alternatives & discover a whole manner of alternative products being sold online. I'd like that to change & I hope I've created a strong brand that will make the regular consumer sit up & start to question what's in their usual skincare. Thanks for sharing. I love the name and packaging. After browsing the site I'm very interested in the healing balm and have added it to my wishlist.